In Dark Agenda, New York Times bestselling author David Horwitz exposes not only the progressive war against Christianity, but also a war against America and its founding principles, which are Christian in their origin. Dark Agenda is about an embattled religion, but most of all, it is about our imperiled nation. Tackling a broad range of issues from prayer in the schools to the globalist mindset, Horowitz traces the anti-Christian movement to its roots in communism. When the communist empire fell, progressives did not want to give up their utopian anti-God illusions, so instead they merely changed the name of their dream. Instead of “communism,” progressives have re-branded their movement as “social justice.” Dark Agenda shows how the progressives are prepared to use any means necessary to stifle their opponents who support the concepts of religious liberty that America was founded on, and how the battle to destroy Christianity is really the battle to destroy America. 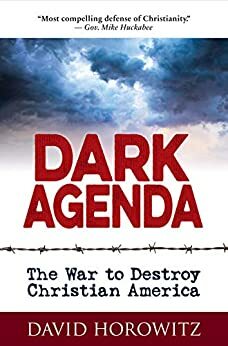 Dark Agenda — The War to Destroy America by David Horowitz is another masterpiece tome by a prolific and relentless conservative warrior who has previously exposed and documented in a series of now classic books the destructive and malevolent history of the New Left from the 1960s to the present. These books include such tour de force tomes as Destructive Generation: Second Thoughts About the Sixties (with Peter Collier; 1989), Radical Son—A generational Odyssey (1998), and more recently the Black Book of the American Left (2016). His new book is a little different, considering that Horowitz was a former communist progressive, who is still an agnostic Jew and independent thinker, even if he is now an uncompromisingly leader of the conservative movement. Dark Agenda is an expose of the left’s savage war against God and Christianity with the goal of replacing God with progressive socialist man as the ruling deity of social justice and the new world order. Horowitz points out that Christian principles were behind the guiding light of the American Revolution and the ideals bolstering the foundation of the American Republic. It is because of this Christian foundation as basis for moral principles, patriotism, and conservatism that liberals, from Margaret Sanger and Christopher Hitchens to Ted Kennedy and Barack Obama, have waged an unremitting war against Christianity, subtly in the case of some and not so subtly in the case of others. The Judeo-Christian ideals upon which this nation was founded are abhorrent to the new left and the Democrat party because they are an obstacle to government usurpation. Along the way, Horowitz also exposes the atheistic and radical objectives of such organizations as the ACLU and the judicial activism of the courts in banning prayer from schools and Christian symbols from public buildings. At the same time religious speech has been disallowed in political discourse, and Christianity itself extricated from the popular culture. He does not forget to describe and document the virulent hatred of liberal atheists toward those who espouse Christianity and conservatism. I recommend this book without reservations as a masterful and energetic, yet captivating defense of the defining principles of conservatism and the American Republic. It is clear, eloquently-written, passionate and well-documented. If you are conservative, you will love this book; if politically neutral, it should persuade you to critically think and perhaps erase the mist of biased obfuscation and misinformation with which we are daily assaulted; if bleeding heart liberal, it may upset and shame you! Miguel A. Faria, M.D. is an Associate Editor in Chief in socioeconomics, politics, medicine, and world affairs of Surgical Neurology International (SNI). He is the author of Vandals at the Gates of Medicine (1995); Medical Warrior: Fighting Corporate Socialized Medicine (1997); and Cuba in Revolution — Escape From a Lost Paradise (2002). His upcoming book is America, Guns, and Freedom — A Journey Into Politics and the Public Health & Gun Control Movements (2019). 207 people found this helpful. Few know the inside working of the communist left like David Horowitz. Not only was he raised by communist party member parents, but he was one of the principle founders of the New Left during the 1960s and 1970s. He has a powerful intellectual mind that can not only retain a great deal of facts and historical events, but he astutely analyzes these facts with an insight that is difficult to compare. He is one of the great minds of the modern world. This book should be included in the reading material of all high school children as well as university and college students. It is difficult for the rational mind to comprehend how anyone possessing a rational mind could disagree with the major themes of this most important work. The radical left is destroying the very fabric of a compassionate, orderly and Christian world with lies, distortions, violence, false history and intimidation. Perhaps this will wake up some of these stuporous minds. 5.0 out of 5 starsGreat book for Conservatives. It defines our history over the last 50 years. He articulates the urgency we need to have to save our country. 96 people found this helpful. As an individual who wrote articles for the left and has a true understanding of their motivations Horowitz writes another insightful expose of their plans. "Dark Agenda" is an excellent book - as are many of his books. To be anti-Christian is no different than being anti-Semitic. As a Jew I know that Christianity as a worldview received most of its values from ours. It is the closest world religion to Judaism. Attacks on Christians and their values is an attack on Judaism as well and many values which we hold as true. This book explains in detail how the Left is attacking Christians and their values. Regardless of how one feels about Christianity, the concept of demonizing a group based on their religion is unacceptable. We Jews were singled out for hate in Germany which ultimately led to the Holocaust. This kind of hate should never happen again for any group. Learn about the real reason the Left attacks Christians. It is not because they understand Christianity (they don't) and choose not to be believers. The true reason is much more nefarious as Horowitz reveals. 106 people found this helpful. David Horowitz, a self described “red diaper baby” of New York Jews, goes to the ramparts in an attack on the Left’s war against Christianity. A clear synopsis of 50 years of the characters, history and ideology of the “progressive” assault on the white Protestant Christian values which establish the idea of America. Uniquely, and unapologetically, Horowitz describes how the core Protestant Christian RELIGIOUS beliefs, “justification by faith,” and “the priesthood of all believers,” established the idea of America: checks and balances, equally before the law, freedom of conscious, and diversity. Following the tradition of the French Enlightenment, however, today’s leftists have attacked all religious principles as “unreasonable” and “illogical.” Indeed, cultural rejection of all religious principles is NECESSARY for the leftist revolution to succeed. Horowitz particularly details how the Left has used the power of the unelected Supreme Court, instead of the democratic legislative process, to achieve its cultural objectives. Horowitz’s brief and lucid descriptions of all of the key Supreme Court religion precedents are accessible to a layman, even explaining how the “establishment” clause has been interpreted to eviscerate the guarantee of the right to the “free exercise” of religion, in the same First Amendment. An important, unique treatise on the issue lying at the heart of our culture war and explaining the requirement to resolve this conflict to achieve peace. 73 people found this helpful.